Use the latest IBM tools and analysis to protect your social platform, including IBM® X-Force® security data and phishing analysis. Use IP layer filtering to discard emails sent from suspicious IP addresses. A filter module and URL filter database detect malicious URLs. You can also inspect email attachments using behavioral analysis that takes preemptive action. Design your platform for efficiency and speed, putting filters where they work best. A zero-level analysis module inspects streaming email and discards spam, helping to minimize the cost of writing content to disk and increasing filtering speed. Reduce spam and viruses to improve overall system performance. Block spam from your inbox and access more than 20 analysis modules for custom email scanning. Give users personal control over email content sent and received. Block unwanted future emails from selected senders in the inbox. IBM Notes® enables you to view email blocked and stored at the security gateway to help recover content that was inadvertently quarantined. Manage personalized block and allow senders lists, and use Unicode analysis to enable content filtering in a variety of languages, including double-byte character sets. Use a single, web-based console to manage email security, even in a clustered environment. Create policies for custom spam filtering, define senders and recipients, specify delivery and identify analysis modules to use and actions to take. Apply filtering rules to individuals, groups or domains. View centralized reports on demand or according to a defined schedule. Receive virus protection for IBM Lotus® Quickr® for IBM WebSphere® Portal and IBM Connections™ deployments. You can access detailed system requirements for Lotus Protector for Mail Security at the following link. Software appliance: Install the Lotus Protector for Mail Security software appliance on off-the-shelf IBM System x® hardware and deploy as a physical appliance. The Lotus Protector for Mail Security 2.8.3 software appliance is certified to run natively on high quality, cost-effective Lenovo System x hardware as a physical appliance. Virtual Appliance: Install Lotus Protector for Mail Security on supported VMware software and deploy as a virtualized appliance. 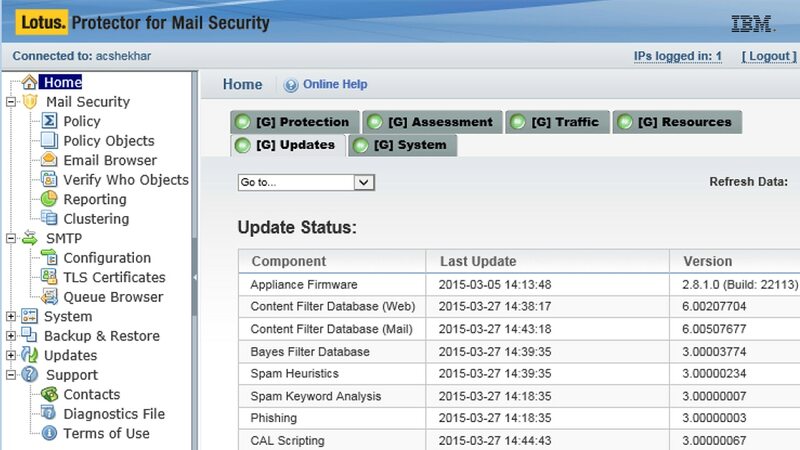 Lotus Protector for Mail Security 2.8.3 is certified to run on VMware as a virtual appliance. Ideally suited for small to midsize businesses and scalable to more strategic operating specifications as required.